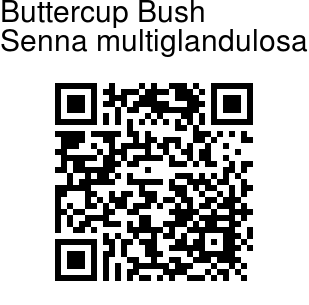 Buttercup Bush is a shrub native to Mexico, Guatemala, and western parts of South America, but it is widely cultivated as an ornamental plant and in some areas of the world has become naturalized in the wild. It is a hairy or woolly shrub which can grow to 6 m in height, becoming treelike. The leaves are each made up of several pairs of thick, hairy, oval-shaped leaflets each measuring up to about 4 cm long. The leaves are studded with visible resin glands between the leaflets. 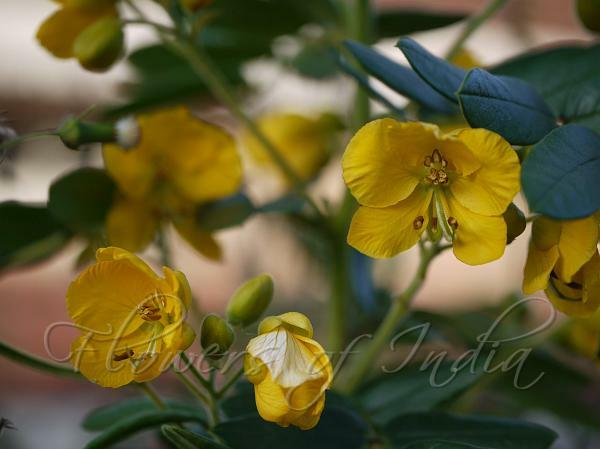 The inflorescence is a raceme of several flowers, each with five golden yellow petals measuring 1-2 cm long. The flower has seven fertile stamens with large anthers and three sterile staminodes. The fruit is a legume pod, flattened or inflated and coated in hairs, reaching up to 12 cm long and filled with beanlike seeds. Photographed at resort garden in Ooty, Tamil Nadu.